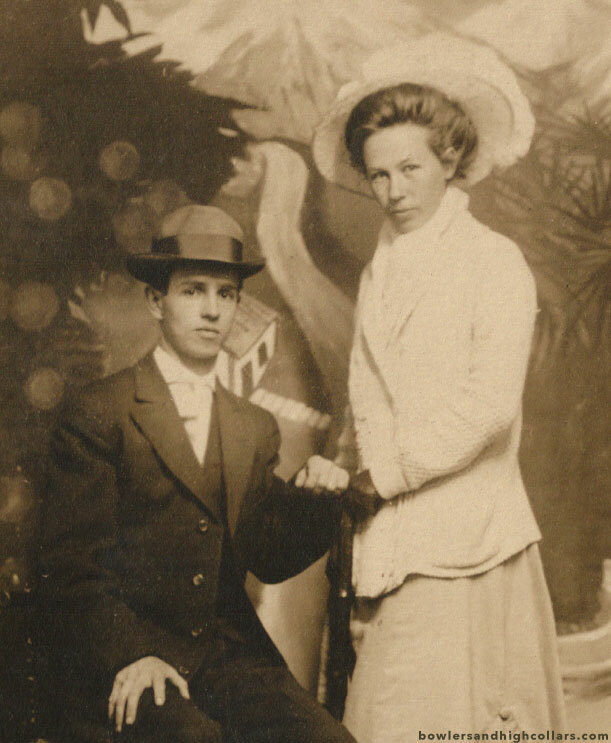 Edwardian Jack and May Brown. Detail of RPPC. Private Collection. Beautiful May appears confident. By contrast, Jack is a bit uncomfortable. He looks very young too. I imagine them to have had a lively and spirited relationship. What do you think, were these two a couple or brother and sister? The way they’re facing each other I think they were a couple, and May was a few years older than her husband, that or her body language and expression made her look like the more mature one of the two (which isn’t hard to do. Right, ladies? :-). The backdrop is folksy with the little painted house in between them and the high snowy mountain peaks. By contrast, the foreground has a tropical feel to it with what looks like an orange tree and palms. I wonder where these two were…California? 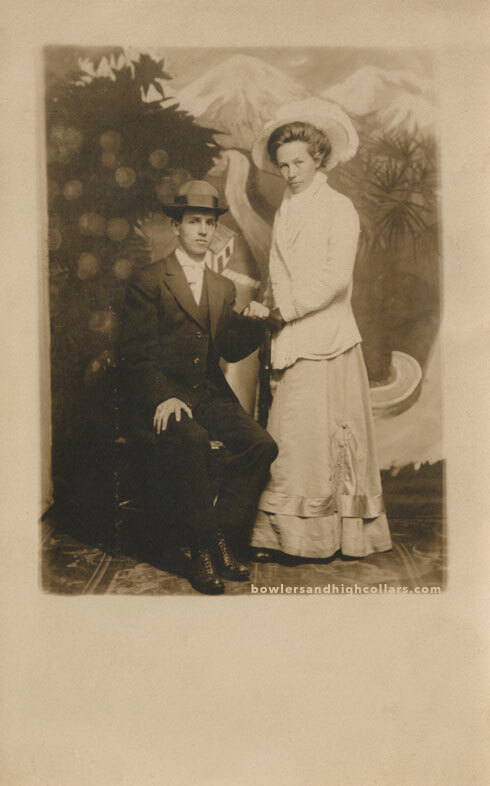 This picture is dated March 28, 1909. Budapest 1940s couple. Private Collection. A photogenic Hungarian couple in profile. They look like film stars, don’t they? Whoever they there, they took a great portrait together. Are you a doll too? PC Paris #1925. Postcard. Private Collection. What an interesting French romance postcard! The man is the same as on these two postcards, but I’m not sure about the woman. Between them is a porcelain doll she is using to touch the man’s neck. The doll itself is giving her a side glance! This is the first time I see a doll prop on these, and I absolutely love how the photographer used it! It’s a bit surreal, almost as if the doll is alive too.